What's Next for NASA's Dawn Probe at Dwarf Planet Ceres? NASA's Dawn probe captured this image of Ceres on Feb. 25, 2015. Dawn will begin studying the dwarf planet in earnest after the probe reaches its first science orbit on April 23, 2015. NASA's Dawn probe has begun orbiting Ceres, but the spacecraft still has some traveling to do before it starts taking the dwarf planet's measure. 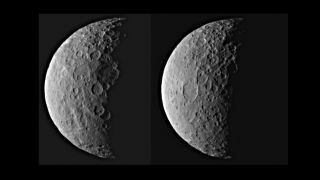 Dawn "is working now to reshape its orbit around Ceres," Dawn mission director and chief engineer Marc Rayman, who's based at NASA's Jet Propulsion Laboratory (JPL) in Pasadena, California, wrote in a blog post Friday. Dawn's current trek is so leisurely because the probe uses low-thrust, hyperefficient ion engines rather than a traditional chemical-propulsion system. "If you hold a single piece of paper in your hand, the paper will push on your hand as hard as the ion engine pushes on the spacecraft," Rayman said during a news conference Friday. So the world will have to wait a little while to get its first big Ceres fix. Indeed, Dawn is currently on the dwarf planet's dark side and won't even beam home any new photos of Ceres until April 10, Rayman said. The $473 million Dawn mission launched in September 2007 to study Vesta and Ceres, the two largest objects in the main asteroid belt between Mars and Jupiter. Vesta is 330 miles (530 km) wide, while Ceres' diameter is estimated at 590 miles (950 km). Both objects are intact protoplanets whose further growth was halted by Jupiter's immense gravitational tug. So Dawn's observations should yield insights into the solar system's early days and how rocky planets such as Earth are put together, mission team members have said. Dawn will map Ceres' surface in great detail, helping researchers determine what the dwarf planet is made of and yielding insights about how it formed. The spacecraft will also investigate Ceres' mysterious bright spots — which are likely deposits of either water ice or salts — and seek to confirm and characterize water-vapor plumes spotted recently by Europe's Herschel Space Observatory. Dawn will perform this work through June 30, 2016, from a series of four science orbits that will be successively closer to the dwarf planet. The final orbit, which Dawn should reach this December, will take the probe within just 230 miles (370 km) of Ceres' cratered surface. "By the time we finish in mid-2016, we're going to know Ceres in exquisite detail," Dawn Deputy Principal Investigator Carol Raymond, also of JPL, said during Friday's news conference. "We're going to understand why it has very, very bright spots — which are unique to any body in the solar system that has been explored thus far — and we're going to understand what Ceres means in terms of a building block for planets in our solar system." So Raymond and her colleagues are excited to see just what Dawn discovers over the next 16 months. "We've been creeping up on Ceres for months, and the anticipation has been growing," Raymond told the Slooh Community Observatory during a Ceres webcast on Friday. "This is certainly a big milestone for us, but mainly, we're already in the frame of mind that Dawn is at Ceres. We've been getting some beautiful data images … and it's looking like a very interesting world, so we're all very anxious to get a better look."